Can I be straight forward with you? They're boring, they're bland and sounds malnourished, right? ...and hence you're looking out for the best soundbar under $200, aren't you? ​To be honest, today's TVs are a total makeover compared to TVs what we used to use a decade ago. The picture quality look surreal, they're available in every imaginable size, and they've become smart too. Speakers available on them are a total mess​ and they're there just for the sake of it! Hence why I always suggest getting a new soundbar or speaker system with your brand new TV. This is the reason why I've written this guide; suggesting the top rated soundbar system available under $200. Well if you’re tired of your under-performing, good-for-nothing TV speakers and you want a Soundbar that’s quite an improvement over it, and comes under budget as well? Then the ZVOX Audio Z-Base 220 is the best Soundbar under $150 that you can buy right now and is also termed as the World’s Smallest Home Theatre System by the company. The overall design of Z-Base 220 is quite similar to its higher end model and hasn’t changed; over all these years. In the 220, you get a display at the side that notifies volume, source and other features as well. Underneath the display there’s physical buttons like: Power, Volume Up/Down, Input Source, and 3.5mm stereo jack for connecting your smartphone to the Soundbar with an Aux cable. This 3.5 inches high and 17 inches wide Soundbar has clear mid range and stands in no comparison with your malnourished TV speakers. Its bundled one-page manual is easy enough to understand, and quick enough for a newbie to get started with the Soundbar out-of-the-box. The 220 offers a slew of Virtual surround sound settings, however it doesn’t feel natural and you’re good enough not using it. For such a low price; you get a 3.1 channel system that contains 2 inches of 3 speakers each and 5.25 inches of downfiring subwoofer. It’s kind of a surprise to me that Z-Base 220’s Low profile wooden built cabinet stores plenty of electricals inside but sounds brilliant for the price. Moreover it’s 12.5 inches of wide base is capable enough to hold upto 27 inches of TV size on it, however due to the built-in subwoofer, things can get shaky at times. In this modern day and age where everything is going portable, wouldn’t it be great if you could carry your Soundbar with you? Well if you think the same way, then Bose Soundlink Mini II is an ideal choice for travel enthusiasts who like to carry their (high quality) music with them. ...and hence Bose happens to eliminate that dilemma altogether. Available in Carbon and Pearl color: this portable Soundbar is just 7.1 inches long and weighs 1.5 lbs, and comes along with a charging cradle that weighs 2.8 ounces. This best Bluetooth Soundbar under $200 may not be an ideal TV Soundbar choice, however if you want to switch from your boring tv speakers to a souped up premium sound, you cannot miss the Bose Soundlink Mini II. This small Soundbar runs on battery and can stay alive for 10 hours on full charge, long enough for watching 3 movies back-to-back or listening to a very long music playlist. 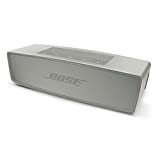 As we all know that Bose is known for its minimal design and hence why Soundlink Mini II is no exception either. The entire speaker chassis is made up of aluminum that gives it an elegant look and rigidity as well. The front and back grille too don’t flex; making the speaker a (solid) bang for your buck. To protect the speaker from accidental damage, you can get a soft cover for Soundlink Mini II and a hard shell travelling zipper case as well. Few buttons at top are available on the Mini II, they are: Power Button, Volume Up/Down, Bluetooth Pairing, while the centre button offers control playback and acts as cell phone speaker; incase you receive a call while your phone is connected to the Mini II. You get voice notification: when the speaker is turned on, Bluetooth pairing is activated, when saved Bluetooth device is connected by speaking its name, Caller’s name when you receive phone, battery percentage and so on. To be honest, when you’re looking for the Best Soundbar under $200, there aren’t many good options available right now, and instead of suggesting average speaker system. I value the people that visit my site, and I always wish that they get full justice in a product; for the price they’re paying. The JBL Xtreme available at a price marginally shy of $200 (at the time of writing) is a super sized speaker that isn’t entirely portable nor is it big enough to be called a full fledged soundbar system. It’s basically a JBL Flip 3 on steroids and with a massive sound upgrade due to its twin 63mm woofers. 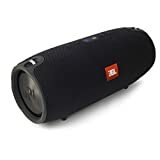 The JBL Xtreme is available in three colors: Black, Blue and Red, and its package contain the speaker itself along with a wall adapter and shoulder strap to carry the speaker. Design wise, the Xtreme doesn’t looks sleek at all, and is fat instead; with two hooks on either side to attach the (provided) shoulder strap. Note: If you hate the idea of carrying this speaker on your shoulder, I'd suggest going for Mesh Travel Case for the JBL Xtreme that allows the use of speaker when stored in it and also acts as a great travel pouch. Being splashproof, the JBL Xtreme is completely covered with a water resistant fabric and a zipper at the bottom that hides its connectivity ports like Service port, Aux in, Charging port and two USB ports for charging other devices. A 10,000 mAh battery is fitted into the Xtreme that makes sure the speaker doesn’t give up on you, while you’re watching your favorite movies or listening to music with your friends because it offers 20 hours of battery life. This Bluetooth Soundbar has a hard plastic stand underneath that will stop the speaker from shaking or producing vibrations. ...hence you can keep it on the centre table, away from the TV and enjoy fantastic sound upclose. If you’re looking for the best Soundbar for gaming and need the finest looking Soundbar under $200, you ought to go for the Razer Leviathan; eyes closed. Out of all the sound bars mentioned here, I personally love the design of Leviathan; the most. Coming out of its great designed gaming products factory, this Soundbar from Razer is no exception either. Unlike most soundbars mentioned in this article, the Razer Leviathan Soundbar is small in size, considering the fact that it will be used by young people living in dorm rooms. Can you believe that this 20 inch Soundbar packs in a 5.1 channel sound sound system? With inclusion of 5.1 Dolby Digitial, you’ll experience a proper surround sound even with such a small system. Moreover you get a great looking subwoofer as well for an immersive bass performance accompanying this tiny sized Soundbar. The subwoofer contains a 5.25 inches down firing bass driver that is loud enough to fill an entire room, and tight enough to ensure the bass isn’t overpowering. Coming to its design, the Razer Leviathan Soundbar is small enough to sit under your computer screen and serve as the best Soundbar for gaming, movies and music listening. There’s few buttons included on the soundbar like: a big power button, a source button to switch between optical, aux and Bluetooth, Bluetooth button to start pairing Bluetooth device, a Dolby Digital 5.1 button, Mute, Audio Mode button that switches between Gaming, Music and Movie, and a volume up/down button as well. The subwoofer on the other hand looks more stylish compared to the Soundbar. It’s top has Razer’s logo, while the entire subwoofer features a minimal design made up of high quality plastic, while the bottom contains the 5.25 inches woofer unit. Talking about its sound quality, the Razer Leviathan packs a bomb. You get a tight sound from such a small system. Though it may not fill an entire living room, however for your bedroom or your dorm room; it’s an ideal choice. Just under $200, you get a low-profile Soundbar from ZVOX that can be kept under your TV, enabling you to listen to a dynamite sound. To be honest, I personally didn’t liked the design of ZVOX Soundbar, which hasn't changed from 2004, however when it comes to audio quality; they do pack quite-a-serious punch. The Soundbase 350 is a great choice for people who hate wire fuss and want everything arranged in a single cabinet, and that is what ZVOX offers. This 24 inch long Soundbar comes with a 3.1 channel speaker system; consisting of 5.25” bass driver and three 2” speakers that completes the package. ZVOX recommends placing upto 42” screen size TV’s on the Soundbase 350 with a max TV base of 23 inches. Unique Selling Point for this best TV speaker is ZVOX’s Accu Voice feature that enhances vocals and dialogues in the audio content you’re listening, allowing you to keep the overall speaker volume low. There’s also a small remote control that offers various controls like Power, Input, Volume, Bass-Treble adjustments, Accu Voice, Output Levelling and Mute button. Just like me, the ZVOX too hates connecting multiple wires between your TV and Soundbar, and hence why you just need an optical TOS link cable to make a connection and enjoy Dolby Digital sound as well. There’s Bluetooth connectivity to connect the Soundbase 350 for wireless music listening. Towards the right side of the Soundbar you have a small display that notifies about volume, Bluetooth connectivity, source and so on, it also turns off when not in use saving you electricity and distraction as well. This wood cabinet built Soundbar has slew of other features in it like: it reduces loud commercial volume saving you headache, and can also be programmed to use your TV or Cable box remote to control the ZVOX’s sound. If you’re looking for an aesthetically premium designed Soundbar that not only offers great sound quality but also comes from an innately popular audio brand, then you should zero down on Polk Audio Magnifi One. Note: At the time of writing, the Polk Audio Magnifi One is slightly over the $200 price range, however considering all the goodness you get for just a marginal high price; I just couldn’t resist mentioning it in our list. Just like the previously mentioned Razer Leviathan, the Polk Audio Magnifi One comes with a (long) Soundbar coupled with a massive subwoofer to complete the package. With a height of 2 inches, the Soundbar is sleek enough to not be noticed and its width of 35 inches is long enough to couple up as a great companion with your brand new flat screen TV. This best Soundbar subwoofer combo is a 3.1 channel speaker system that offers Polk’s Voice Adjust technology which ensures you hear clear vocals regardless of the volume, placement or source sound quality, which definitely makes it the best TV Soundbar under $200. Depending on the content you’re watching, you can change the Equalizer settings of Magnifi One that ensures an immersive, room-filling sound. Moreover its package contains an IR Remote Control, 6ft. 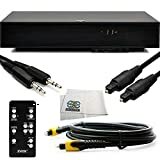 Stereo Cable, Optical Cable, 2 RCA adapters and 4 Rubber Feets that makes sure you get a complete package and don’t need to buy aftermarket accessories after buying the speaker. The subwoofer on the other hand is a piece of excellent that is intricately designed allowing a minimal but noticeable design. Trust me your friends won’t stop drolling over the design of both the Soundbar as well as the subwoofer. The subwoofer’s cabinet is built with high quality materials with curvy edges and a down firing driver that is loud enough to fill an entire room and clear enough to not overpower bass or distort at loud volumes. When it comes to affordable, reliable and bang-for-your-buck soundbar, Vizio is a brand you should be looking out for. Hence why I’ve mentioned product from this brand in my previous guide about best soundbar under $300. This 2.1 channel soundbar from Vizio comes with a sleek and practical design, with nothing too fancy or complicated nor too boring as well. It’s design will fit well in any kind of house, be it a posh villa, your living room or just an addition to your kids room. The SB3821-C6 is one of the best soundbar with subwoofer available under $200 that is a great fit for small as well as large TVs, and can simultaneously either be wall mounted or kept on the TV desk. Best part about this Vizio soundbar is that the subwoofer unit is wireless and hence you don’t have to keep it anywhere close to the soundbar just for the sake of it. Coming to its features, this soundbar offers 100dB sound output with a 2.1 channel setup that is loud enough to fill an entire living room, and with Total Harmonic Distortion of less than 1%; your sound wouldn’t distort like other cheap soundbars. For people looking to connect their smartphone with this soundbar, it also comes with Bluetooth connectivity and hence can connect with any Bluetooth transmiting device as well. At the top of Vizio soundbar there’s plenty of quick function buttons as well like: Power, Input Source Selection, Bluetooth Pairing, Volume Down, Volume Up. It’s back features plenty of connectivity options like USB port (to play music via Pen Drive), RCA connectivity, 3.5mm Aux connection to connect your smartphone via an aux cable to play music, Coaxial Input and Digital Optical Audio input as well. Moreover Vizio also provides required cables in the box to connect it to your TV. 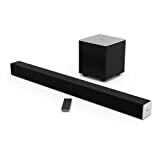 The remote provided with this soundbar subwoofer system is pretty good compared to fidgety and non durable remote control you get with other systems, and long enough to hold it easily. This long soundbar from Samsung is an amalgamation of character and premium-ness at a truly affordable price. It’s a 35 inches long soundbar that comes with a 2.1 channel setup with 6.1 inches wide subwoofer that’s good enough to add thump to your audio. The HW K360 is the best soundbar for music listening and with 130 Watts of sound output; makes sure that your music is loud enough to accompany you in your home. Since it comes with a wireless subwoofer, you can keep it anywhere in the house without the requirement of it being close to the soundbar. Bluetooth connectivity enables it to connect to any device and stream music wirelessly, moreover you can also use your smartphone as a remote control by downloading Samsung’s Audio Remote App. The provided remote control feels premium and is long enough to fit easily in your hands, it features fairly big buttons which would be a great help for elders who have trouble differentiating markings on small buttons. If your main purpose is to listen music, then the K360 is a great fit as it offers clear vocals and crisp sound at a price just under $150. Coming to the soundbar, its design is very sleek and low profile, and with a metal grille on the front gives it a premium look and feel. You also get a LED display at the center of the soundbar that displays input source, volume and other features, and shuts off immediately after use. Would you mind if I tell that you can get a premium 5.1 channel surround sound system that costs under $200 and long enough to be a great fit for 5﻿5 inc﻿h TV? Well Vizio S4251w-B4 is the answer to the above question. This 42 inches long soundbar is an ideal companion if you’re planning to buy a large TV for your multimedia entertainment. Along with the soundbar, you also get a subwoofer and two external satellite speakers that completes a true 5.1 channel surround sound system setup. The included subwoofer is wireless as well and just like the previously mentioned Vizio SB3821-C6 can be kept anywhere in the room. However the provided satellites needs to be connected to the subwoofer to complete 5.1 channel setup. I’d recommend going for an Adjustable Satellite Speaker Stand to save you from the hassle of wall mounting them. It also comes with a stylish and long remote that has a single line LED screen on it notifying about volume, input source, mute and so on. The soundbar is capable enough to produce 102dB of sound, which is close to the sound that is generated in a rock concert that in turn is more than enough to fill your big living room. Unlike other soundbars we’ve seen till now, this is the longest soundbar in our list and the entire front is a cloth grille with a white margin that starts from the left and ends in the right connecting with the Vizio branding. At the bottom left corner, there’s multiple small LEDs that quietly notify about the soundbar's volume level. Connectivity wise, it features Bluetooth connectivity for wireless music streaming, while the back includes a USB port, Optical input, Coaxial mini jack, analog and RCA connectivity as well.